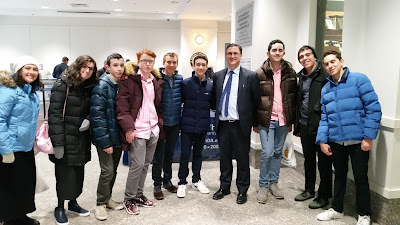 Last Tuesday, the Yeshivah of Flatbush Mock Trial team accompanied by their coach Mr. Howard Rothbort visited the State Supreme Criminal Court and the Federal Courthouse for the Eastern District in downtown Brooklyn. They were met there by Brooklyn Assistant District Attorney David Klestzick (E.S. '83, H.S. '87) who gave them a brief introduction and accompanied them to criminal pre-trial hearings in the Honorable Judge Murphy's courtroom. Students watched as defendants took pleas and attorneys made arguments regarding evidence. The students watched the proceeding from the juror box and were given an opportunity to ask the judge questions. In addition, later in the day the students sat in as a defendant was being cross-examined by the prosecution in a triple homicide trial. The trip ended as students visited the Federal Courthouse where they will compete later this month in the NYC Mock Trial Tournament.